Whether you sew for a profession or just sew for fun, knowing all the right sewing terminology is the first step to showing you know your stuff. All professions, crafts and industries have their own terms and acronyms, and sewing is no exception. There are so many words, phrases and sayings that might make you scratch your head in puzzlement; but we are here to break things down for you. To give you a comprehensive guide to sewing terminology, so that you can be ahead of the game, or at least a confident player. 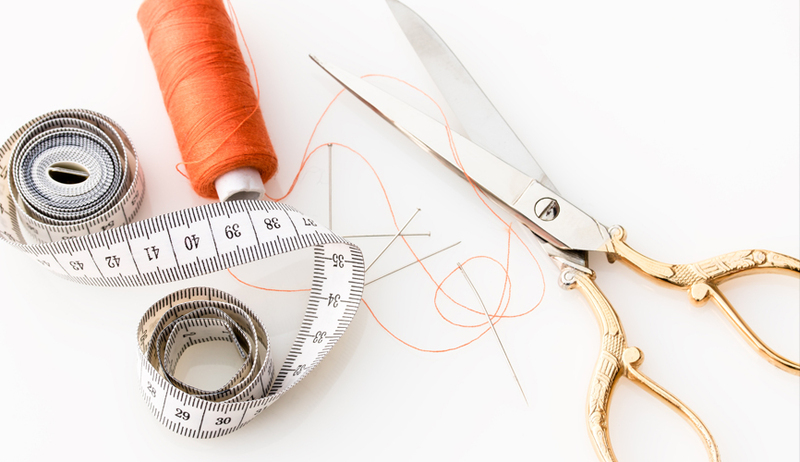 Our ultimate sewing glossary is jam-packed but there might be some terms we don’t mention. If there are any terms you think we should have included, let us know in the comments below. We will add them in, along with your name. However, these 85 words and phrases will give you a great head start. Sewing terminology is exactly what it sounds like; terms and phrases used within the sewing world. If you hear the word “basting,” you might think we’re talking about keeping a chicken or turkey moist while cooking. However, in sewing circles, this word also means long, loose stitches that hold fabric temporarily in place. Feeling more like a sewer yet? 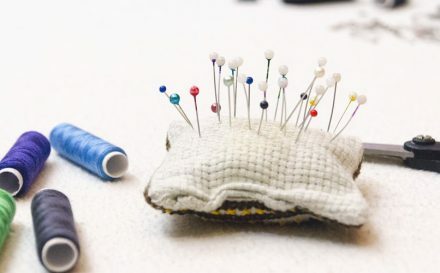 Our glossary will give you the words, phrases and definitions of some of the most common sewing terms that you are most likely to come across and need. The more you sew, the more you’ll know! Oh, and if you are a true beginner, then make sure you check out our blog post on how to avoid the top 13 sewing mistakes. Anchoring stitches – These are machine stitches that are sewn with zero stitch length, to keep from pulling out. This term can also be used to refer to when you stitch backwards for a couple of stitches, to anchor it. Applique – This comes from the French word “appliquer,” which means to apply or put on. In sewing, applique is used to describe the process of applying one kind of fabric on top of another layer of fabric. This is fixed into place by sewing or by another fusing means. It can also refer to a surface embellishment. Armscye – The opening in a bodice to which the sleeve is attached; also known as an armhole. Ballpoint needles – A type of sewing machine needles that are specifically designed to be used when sewing knit fabrics. The rounded tip prevents piercing, that would damage the knit. Baste – Temporary long running stitches, made by either hand or machine, that holds the fabric together before permanent stitches are applied. Bias – A direction of a piece of woven fabric. Usually referred to as “the bias.” This is a 45 degree angle to the gain line, or diagonal direction of the fabric. Binding – A narrow strip of material which is sewn around the edge of a garment, a bag or even a quilt. Blanket stitch – A hand stitch used for finishing a fabric edge. Bobbin – The thread that comes up from the bottom and meets the thread from the spool to form the stitch. Bobbins need to be wound up and inserted properly into a sewing machine. Bumblebunching – That annoying tangled loop of stitching on the bobbin side of the fabric, that is a result of improper tension applied to the sewing machine. Buttonhole – A small cut in the fabric that is bound with small stitching. The hole has to be just big enough to allow a button to pass through it and remain in place. Casing – A folded over edge of a garment, which is usually at the waist. It is used to enclose a way of adjusting the fit – for example for a drawstring. Cord – A twisted fibre, somewhere between rope and string. Crochet – A method using yarn and a hooked needle to make a garment, fabric or lace. Crossgrain – The line of fabric perpendicular to the selvage edge of the fabric. Cross stitch – A needlework stitch that uses 2 stitches that cross over to create a cross shape. Cutting mat – A self-healing board used for cutting fabric on. They are often marked with measuring grids. Dart – A common technique used for shaping garments. They normally appear around the waist and bust. 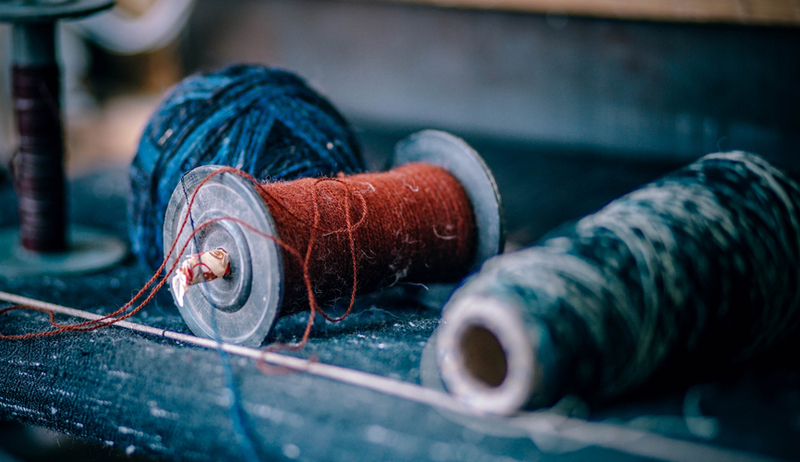 Darn (or darning) – Usually refers to the repair of a small hole, most often in knitwear, using a needle and thread. It is often done by hand, using a darning stitch. It can also refer to any number of needlework techniques that are worked using darning stitches. Double needle – 2 machine needles attached to a single shaft, that sews 2 parallel rows of stitches at once with 2 spools of thread and a single bobbin. Drape – The fluid way that the fabric hangs in a garment. Dressmaker – Someone who makes custom clothing for women. Ease – The allowance of space in a pattern for fit, comfort and style, over exact body measurements. Edge stitch – Straight stitching very close to the edge of a seam, trim or outer edge. Embellishment – A decorative item added to improve the look of a garment or other project. Embellishments can include buttons, beads, jewels, ornamental stitching etc. Embroidery – An ancient variety of decorative needlework. Designs and images are created by stitching strands of one material onto another. Face – The front of a piece of fabric (the right side). Fat Quarter – A quarter of a metre of fabric measuring 18 x 22 inches. Used for patchwork and other craft projects. Feather stitch – Hand stitch used to smoothly join 2 layers of fabric. Can also be a form of decorative hand stitch. Feed-dogs – Small jagged feet that sit under the presser foot of a sewing machine. By lifting and lowering them, you have the ability to use the machine for free hand embroidery. Frogging – The art of unpicking stitches. Gather – A way of gathering the fabric to create fullness in the fabric, such as ruffles. It is a technique for shortening the length of a strip of fabric, so that the longer piece can be attached to the shorter piece. Grain – Describes the direction of the warp and the weft in a woven fabric. Hem – The finished bottom edge of a garment. The hem indicates the edge which is usually folded up and sewn, thus creating a neat and even finish. Hooks and Eyes – Small and sturdy fasteners used at the points of a garment opening. Interfacing – A term for a textile used on the unseen (wrong) side of fabrics. They support and stabilise the fashion fabric of the garment. Jeweller’s knot – A simple knot tied on a strand of thread and then pulled down on a pin or needle to the base of the thread. Ladder stitch – This is a stitch used to close large openings, or, alternatively, to join 2 pattern pieces seamlessly. Stitches are made at right angles to the fabric, creating a ladder-like formation. Lapped seams – Seams lapped one over the other – wrong side to right right – with seamlines meeting in the middle. Lining – A piece of material used to finish the inside of a garment. Linings can hide the seam and make the garments easier and more comfortable to wear. Long stitch – A stitch for tapestry or embroidery which can cover 1 – 12 threads in a single stitch. Match point – A point marked on one pattern piece so it can be matched to a similar point on another pattern piece. Nap – A fabric texture that runs in a particular direction, and requires all other pattern pieces to be cut facing the same orientation. Needlework – A term for the handicraft of decorative sewing. 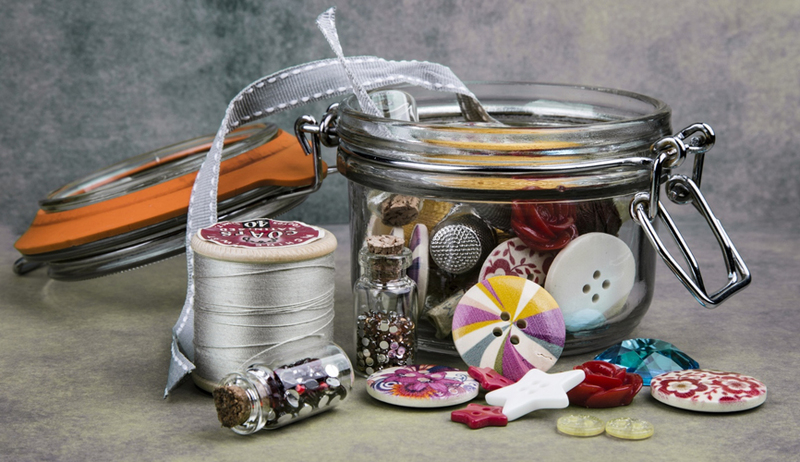 Notions – All of the accessories used in sewing projects. Think zippers, thread, buttons, hooks, ribbons and so on. Overlay – This refers to the top layer of fabric, when there is a different one underneath. Overlocker – Also known as a serger, this is a specialist sewing machine that trims and neatens the edge of fabric. Patchwork – A form of needlework that involves sewing together small pieces of fabric to create a patchwork like effect. This is very popular for quilting. Can be done by hand or by machine. 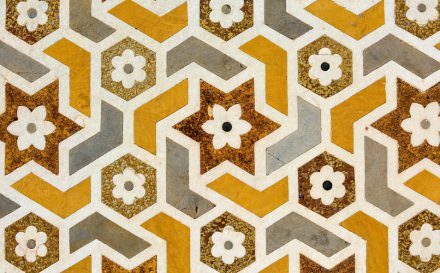 Pattern – A template on paper or cardboard from which all of the pieces of the garment are traced onto fabric. All the parts are then cut out and assembled to create the final piece. Pintuck – A narrow, stitched fold of fabric. This style is usually seen in multiples and creates a stylish and smart finish. Pleat – A type of fold in the fabric created by doubling the material back on itself and securing it in place. When ironed, they create a sharp crease. Presser foot – A small piece of metal near the needle on the sewing machine. It is the function that keeps your fabric in place while you sew. Princess seam – A vertical seam line which gives shape to a garment in place of darts. Usually found on bodices, dresses, jackets, and blouses. Quilting – The art of making a quilt – a decorative piece of bedding or wall hanging made from small pieces of fabric sewn together in batted layers. Raw edge – The edge of the piece of fabric after it is cut but before it is hemmed. If left raw, the fabric might fray. Right side – The front, or face of the fabric. This is the side of the fabric designed to be on the outside of the garment. Ruching – Also known as gathering. Sections can be gathered into seams. Running stitch – A hand-sewn stitch that weaves in and out of the material. This creates a dashed line effect. Seam – The line where 2 pieces of fabric are held together by the thread. Seam allowance – This is the width of the fabric beyond the seam line. The standard seam allowance is normally 1.5cm. Seam ripper – A small tool used for unpicking stitches. Selvedge – The woven edge of the fabric that runs parallel to the lengthwise grain – also called “selvage.” They are the finished edges that do not fray. 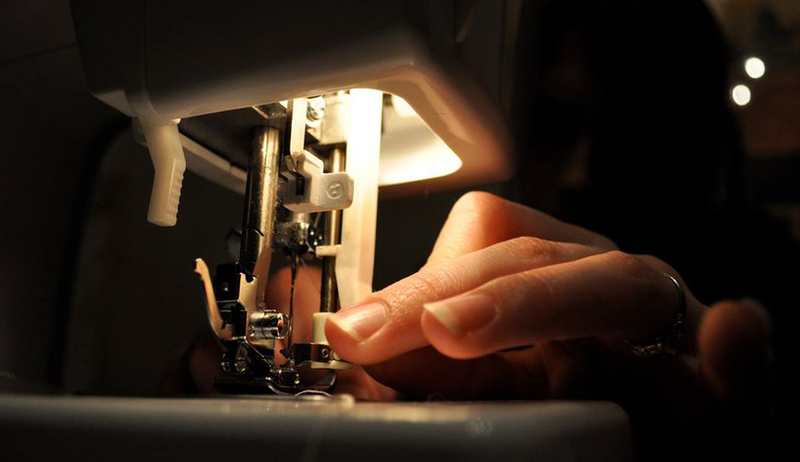 Serger – A type of sewing machine that can seam, trim, and overcast raw edges. Staystitch – Stitching placed on or just outside the seamline. It is used to stablise the fabric and prevent it from stretching out of shape. Straight stitch – A simple, straight stitched line. Tacking – Big stitches used to hold 2 pieces of cloth together to make it easier to sew. These temporary stitches are removed once a permanent seam is completed. Tailor’s chalk – A piece of chalk used to mark fabric. Tambour needle – A pointed hook that is very thin and sharp. It is used to apply beads or sequins, or even chain stitches. Termination point – The place where 2 seamlines end. Thimble – A protective implement worn on the finger or thumb when sewing. Top stitch – A line of stitching parallel to a seam or edge, sewn from the right side. These can be decorative or can be used to add strength to an item. Tuck – A stitched fold of fabric. This can be used for decorative purposes or to add shape to a garment. Underlay – The layer of fabric underneath another layer of fabric. Understitch – When the seam allowances are stitched to the facing along an edge. Vertical bobbin – When the bobbin moves back and forth to pick up the thread. 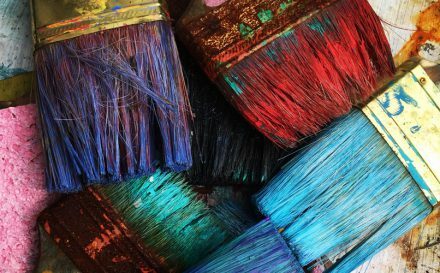 Wadding – A fibrous material used for filling items such as quilts. Can also be known as batting or filler. Walking foot – A presser foot that steps across the fabric, as opposed to sliding. Warp – The lengthwise thread in woven fabric. Weft – The crosswise threads in woven fabric. 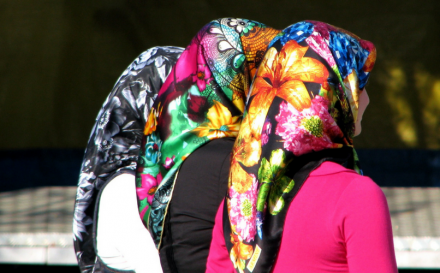 Wrong side – The inside or back of the fabric. The side that isn’t on show. Yarn – A continuous length of interlocked fibres. Can be made from natural or synthetic fibres. Yardage – A term for an undefined length of fabric. Yoke – A panel across the shoulders or the waistline. Zigzag stitch – A zigzag stitch is a literal stitch made with a zigzag pattern. Often used to sew along raw edges to prevent them from fraying. Zipper foot – An attachment for a sewing machine that is designed for installing zippers. Now that you are a sewing terminology master, and you know your zigzag stitch from your ladder stitch, it’s time to get to know the fabrics. Discover and feel over 100 fabrics in your own swatch pack. Next storyWhat is Fleece, and Why is This Synthetic Chosen Over Natural Fabrics?